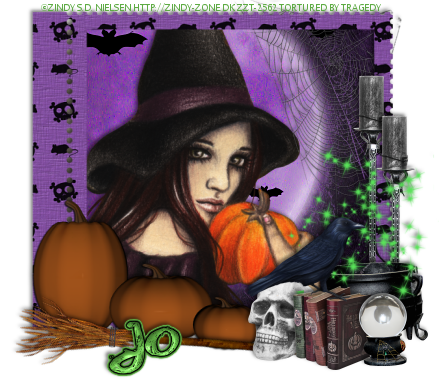 Pumpkin Witch tube by Zindy. Get it HERE. Goulish Feeling kit by CBJ. Get it HERE. Change the layer property on the moon to Luminance. Change the opacity to 60. Select the frame layer in your layer palette. Use your deform tool to position along the bottom of the frame & Pumpkins. Position candles along the right side of the frame. Using your eraser tool remove the handle on the cauldron. Set the source to white and the target to #00c000. Using your eraser tool remove any sparkles too far to the side of the cauldron. Move into position over the cauldron. Position to the left side of the cauldron. Position over the right side of the books. Position standing on the books. Apply eyecandy 4000 gradient glow.